Bollywood actor Ali Fazal is looking forward for his Hollywood debut in a titular role in the movie ‘Victoria & Abdul’ alongside Academy Award winner Judi Dench. Wishes and congratulatory messages started pouring as soon as the trailer was out and it is the first time that an Indian actor was seen in each frame of the trailer. The story is based on the book which goes by the same name written by Shrabani Basu, and on the real-life relationship between Queen Victoria and her Indian servant Abdul. The actor was flooded with congratulatory messages from his fans and well-wishers on social media. Bollywood was nowhere behind to express happiness and congratulate Ali Fazal. Delighted and proud dear @alifazal9 . From strength to strength go on… What a charming trailer. Duly goosebumped. Just saw the promo for #victoriaandabdul @alifazal9 congratulations! So proud buddy!!! Wonderful trailer!! I’m so thrilled for u @alifazal9 #DameJudiDench outstanding as always! Congrats @alifazal9, you deserve every bit of your hard-earned success :). 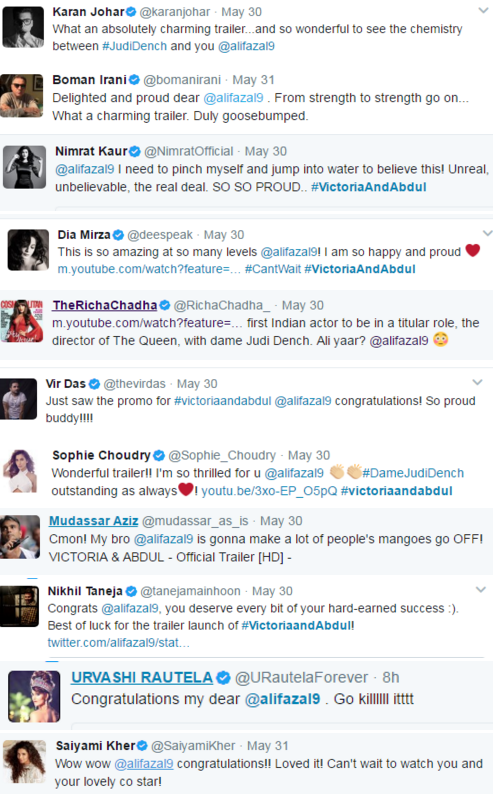 Best of luck for the trailer launch of #VictoriaandAbdul!